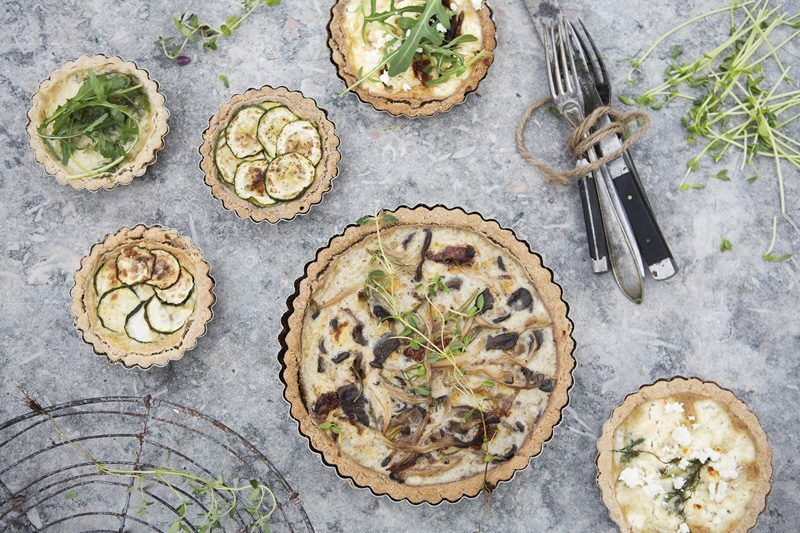 My second thought was that I really craved pizza (or, ehm, pie)! The real stuff. Wheat + rye, yeast, salt, water and olive oil. With tomato sauce and lots of cheese. A cheese pie, I guess that Brooklyn chef would call it. So not too long after breakfast, I whipped up the dough, cooked a tomato sauce and bought lots of mozzarella cheese. While the dough was proofing, I decided to also make a cauliflower pizza base. It’s pretty quick to make, Luise prefers it to the traditional base and I thought ”Better having too much pie than too little” (all my thoughts literally had a Brooklyn accent by this point). We were out of both cauliflower and almond flour so I tried it with broccoli and rolled oats instead. It worked like a charm and had a nice green tone (which turned a little browner when baked). The flavor was less sweet and more earthy but held together really well, Better than our original cauliflower base. We had a jar of spicy green herb sauce left from our meal prep this week so I used that as sauce and went with the whole green vibe and added lemony kale as topping. Instead of mozzarella, we crumbled feta cheese on top because we were already far off the traditional Italian route. Luise added some chickpeas and sunflower seeds that she tossed in olive oil and sumac and we also cracked two eggs on top. Pretty unconventional. But also pretty exciting. It’s a hippie pizza! When both pizzas were ready I had completely lost interest in that cheese pie that I originally craved (kids loved that one though). The hippie pizza was so much more interesting. Literally bursting with flavor and spiciness from that green herb sauce. The kale curled up into chips when baked, the sumac sunflower seeds complemented the crunch and the egg yolks added a nice and creamy contrast. Because I fell asleep, I never saw what conclusion David Chang & Co reached regarding authenticity. But given that this kale pizza probably is as far as you can come from la vera pizza Napoletana and it still was pretty epic, I don’t think authenticity is something we should get too occupied by. As long as it tastes good. Ain’t that right? (still with Brooklyn accent). We tested the recipe again two days ago to double check all quantities. While we were at it, we also made this video for our youtube channel. Our boys’ preschool was closed so they were home with us helping out. They loved the cooking part (especially Isac) but none of them wanted to eat it. Partly because the green sauce was pretty spicy but also because kale isn’t their favorite pizza topping. That’s however what is so great with pizza, that you can shape two pizzas from the same base. So if you are cooking for kids, make one adult version with kale and spicy sauce, and a simpler one for the kids. That’s it for today. 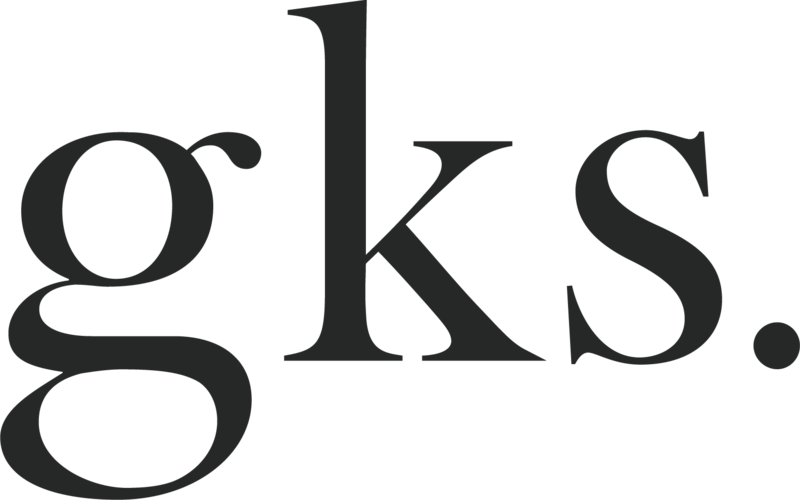 Three blog posts and three videos in three weeks. We are on a roll! Now go make yourself that pizza. Next time we make this I’m going to try half the amount rolled oats and half almond flour for a slightly sweeter base. Place the oats in a food processor and blend until it looks like flour. Discard the thickest part of the broccoli stem, break up the florets and add to the food processor. Mix until it has rice-like consistency. Add eggs and salt and pulse until all is combined. It should be more loose and sticky than a traditional pizza dough. Transfer to the baking paper and form into a pizza base by flattening the dough with your hands, making the edges slightly higher (se video). Pre-bake for 20 minutes or until golden. Meanwhile, prepare the green sauce (see recipe below). Remove the crust from the oven. Spread the green sauce on top. Discard the thick stems of the kale, chop it into smaller pieces and place in a bowl. Drizzle with 2 tbsp olive oil, lemon and salt and massage the flavor into the leaves. Distribute 2/3 of the kale evenly over the pizza. 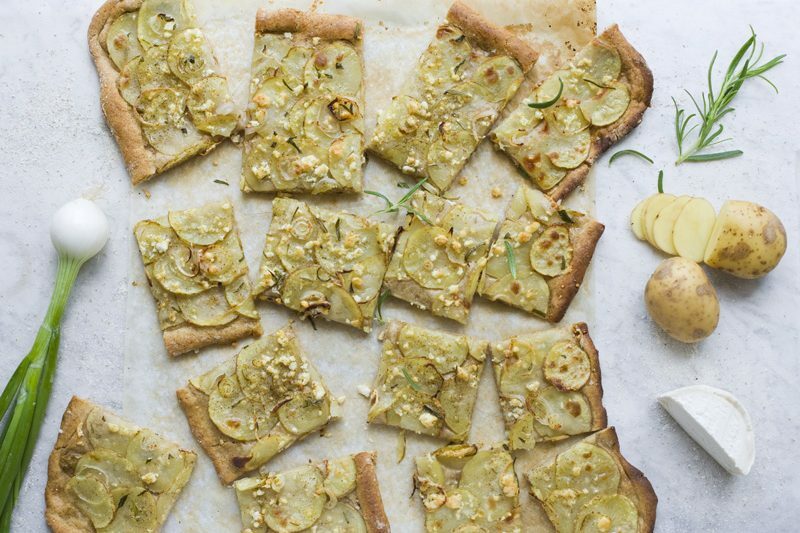 Stir together sunflower seeds, 1 tbsp olive oil, salt and sumac and toss over the pizza along with the chickpeas. 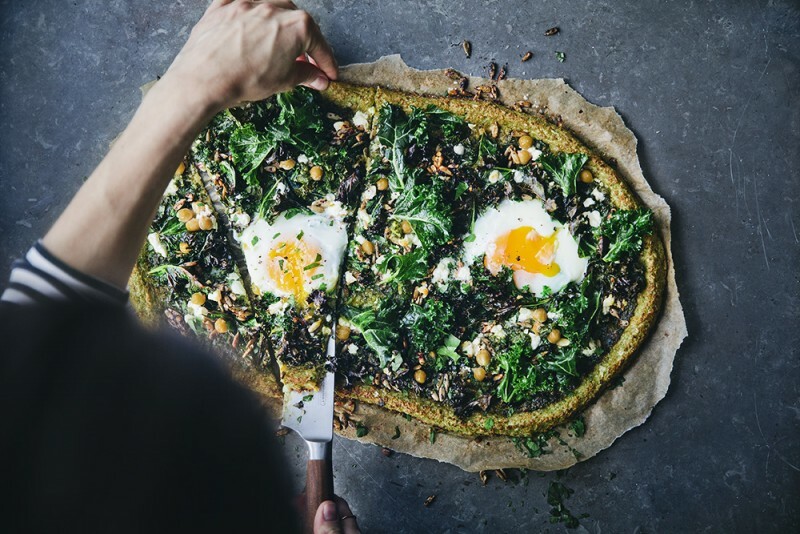 Crumble feta evenly over the pizza, make wells in between the vegetables and crack the eggs into them. Bake for 10-15 minutes more or until the kale is crunchy and the egg whites are firm and the yolks slightly runny. Cut into slices and dig in. 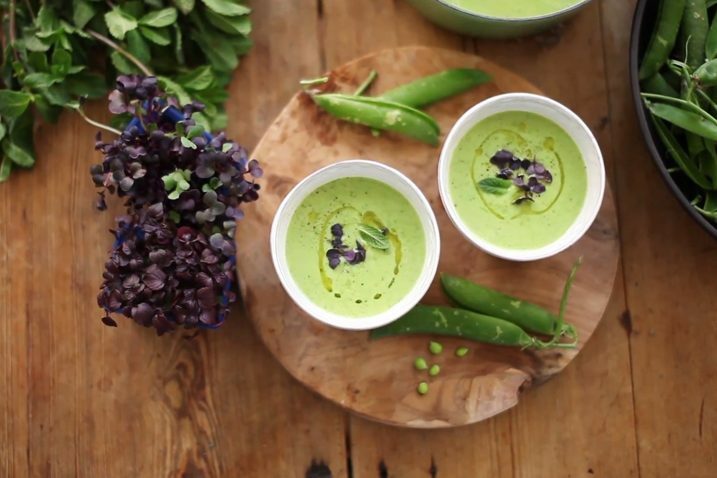 This is a variation on one of our favorite green sauces. We adapt the herbs to what we have at home. You can also replace some of the herbs (but not all) with baby spinach to save some $$$. We like the extra flavor that the heated cumin seeds add but if you want to keep it simpler, just skip it. Heat the cumin seeds in a dry skillet for about 1-2 minutes. Add them to a food processor (or a large pestle and mortar) along with the rest of sauce ingredients. Mix, mix mix, taste and adjust the flavor to your liking. 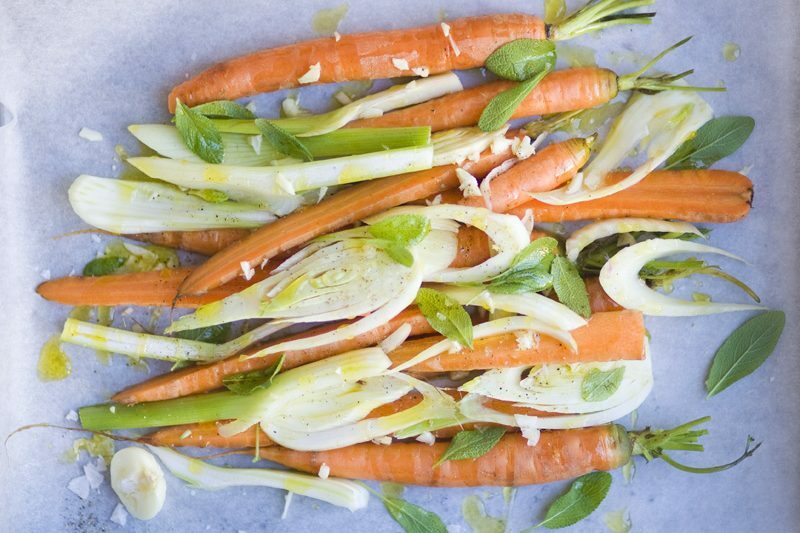 Carrots, Fennel & Sage – Roasted Veggies! Thanks for the Hippie Pizza recipe. Looks delicious on top of being healthy and green. do you reckon this pizza base recipe would also work by using flax eggs instead of the chicken ones? I would still use the normal eggs as a topping, but would love to cut the total egg amount of the recipe :) Thank you! This looks absolutely amazing and I am hoping to make it tonight. One question about the directions--it says to use 2/3 of the kale when you bake the pizza. What happens to the other 1/3 of the kale? Is it supposed to go on top after cooking or save it for another use? Thanks so much in advance for your help! AWESOME Video!! Can't wait to do something with this recipe..well done you! I've tried cauliflower pizza crust but this looks very delicious, and healthy as well. I've pinned it for when that craving hits. I have not yet jumped on the cauliflower crust bandwagon even though it has been in the back of my mind for sometime now. 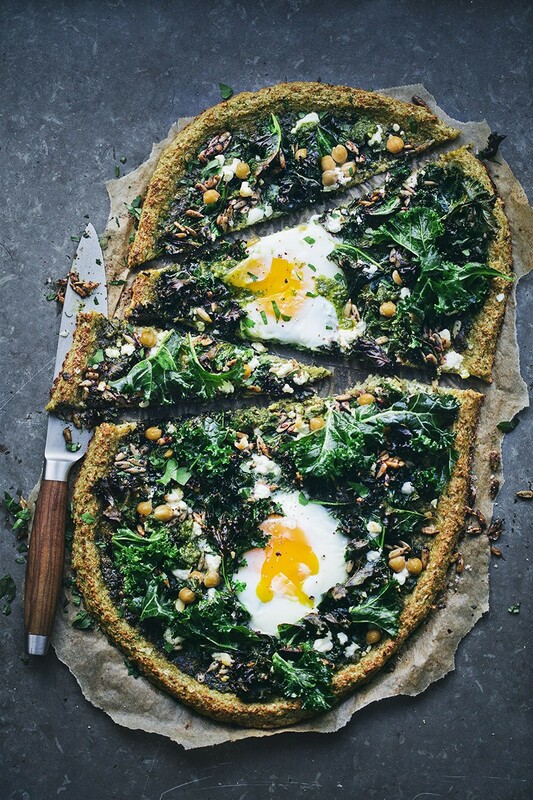 Now seeing this I am so intrigued by broccoli crust that I am going to try this for sure. This looks so good that I think I'm going to have to buy a food processor to make it! Can you tell me what size food processor you are using? I don't want to get one that's too large to save space, but want to make sure the size works with all the recipes. Thanks! This is best home made pizza, you made it perfectly. Thanks for sharing recipe. What size are your eggs? My pizza base mixture was really sloppy. I initially used 75g oats and 25g almond meal, but had to add another 75g oats to try to firm it up as well as letting the mixture sit for a while so the oats could soak up the liquid. It was still too wet to shape with my hands, but worked ok spreading it with a spoon. The only thing I did differently was process the ingredients separately and mix them by hand, as my food processor is too small to hold the whole mixture. That is an awesome looking pizza. Love the idea to put kale on top that curls up into chips. Will try! This looks so delicious and awesome, def want to give it a try as with any of your recipes! Although, I'm allergic to oats – what could I substitute with? Quinoa / buckwheat / spelt / rye flakes, any preferences in terms of flavour and texture, or better options? My daughters and I have really enjoyed the hippie pizza. We have used half of the greens of spinach and half of kale. We skipped the chickpeas and added little tomatos, thanks for the wonderfull job!! Yay! Happy you gave it a try! That look great! But where I live there is no kale and also no sumac. the first one seems pretty essencial... any suggestions on how to replace it? I happen to have all these ingredients in, and we are snowed in, so going to try this today! I'll replace the egg with a box of 'egg replacer' that has been asking to used in the storecupboard, and report back. This looks great, thank you! Wow, this looks crazy beautiful. Do you think flax eggs would work in the crust for a vegan version? Can't wait to give this a try. Thanks so much!